Platform work is increasing worldwide, leaving a serious lack of social protection. In spite of the international and flexible character of platform work, extending social security is feasible – if one is ready to explore new avenues. This article is on setting out for Digital Social Security. Digitalisation changes the world of labour, and it does so in several dimensions. First, it shifts jobs, some are destroyed, others are created. Second, it alters work itself, namely working conditions and tasks. And third, it provides new opportunities for the way labour markets operate: Specifically, digital interconnection makes it feasible to trade digital (or digitally transferable) work at online platforms without any physical contacts from the matching process to the completion of the work. The relevant tasks include more and more activities that are digitalised today but used to be location- or environment-specific in the past. The complexity widely varies, comprising tasks such as information collection, product testing, programming, writing texts, design etc.. Moreover, the allocation of tasks through platforms is also going beyond digital work, sourcing services in regional areas (such as recording retail prices etc., but also work at the premises of the customer). How does platform work develop? Evidently, this development opens up new options for work outside the usual standard employment relationships. Platform work (or crowdwork) follows an exponential trend, even if still from comparatively low levels in most countries. While numbers naturally depend on definitions and measurement methods, for instance a survey report of Ursula Huws and coauthors depicts shares of respondents having ever sold labour via an online platform between 9 and 22 percent for a sample of developed European countries. Platforms can increase market transparency, lower transactions costs and offer new efficient and flexible opportunities for firms – and may also accommodate the wishes of individuals regarding independent and self-determined activities. However, from the national policy perspective, platform work has an informal character. Many see cause for concern, amongst others since the basic risks of life such as sickness, accident, unemployment, old age and nursing care dependency are often not covered by the gainful activity. This is especially true for those individuals relying on platforms as their main source of income. But also in case platform work represents a secondary job, it leaves a gap in that the income from this source usually is not used to strengthen social security. Of course, it is possible that in absence of platforms, individuals would have earned no income at all, so that crowdwork mitigated – and not aggravated – social risks. But still, while taking no stance regarding the desirability of platform work in general, it remains an urgent question how to improve on the evident social deficiencies. Consequently, it comes as a challenge to refine social security for a more flexible working labour force. After all, they are just as much in need of social security as if they worked in traditional employment relationships. If countries provide a relevant welfare system, in absence of social security and in case of need, social benefits step in. But then, tax payers end up as de-facto insurers actually subsidising a growing – often informally operating – sector where wages are pushed below a sustainable level and inducing false incentives to neglect individuals’ social security. Besides this moral hazard problem, adverse selection just as the need for cash discussed below make it unlikely that relying on private initiative of the individuals will lead to satisfying results. Beyond, social security is connected to further positive effects such as on health, the willingness to invest or the identification with the national community. In sum, there are good reasons to extend social security systems to platform work. However, there are also major obstacles many would deem prohibitive. These are discussed in the following. Is organising social security for platform work possible? A significant challenge lies in the international, flexible and short-term character of platform work. In contrast, today’s social insurances are tied to the national framework. Handling the multitude of gigs with ever changing contract partners within the administrative processes of various national social security systems is probably impossible to manage. The same holds true for the creation of a new fully-fledged international social insurance. However, digitalisation, while being a challenger, can also be used for the benefit of social security. A flexible and practicable system would be given by what we call “Digital Social Security” (DSS). It would automatically pay a fixed percentage of the agreed salary into the personal DSS account of the platform worker (either on top of the agreed salary, or as a deduction, or as a mixture of both). This simple pay-as-you-earn mechanism would be the only element to be included into the different platforms. The accrued amounts would be transferred once a month from the DSS accounts to the relevant national social security systems (according to the place of residence, or nationality, if desired). There, all further steps could be handled within existing structures. This includes deciding how to distribute the DSS contributions to the different insurances and generating corresponding claims. The DSS account system could be administered by an existing international institution such as the ILO or the World Bank. An overview of the system is given in Figure 1. Key is the automatic mechanism in the platforms, which replaces a probably infeasible direct coordination between all customers and social security systems on a case-by-case basis. 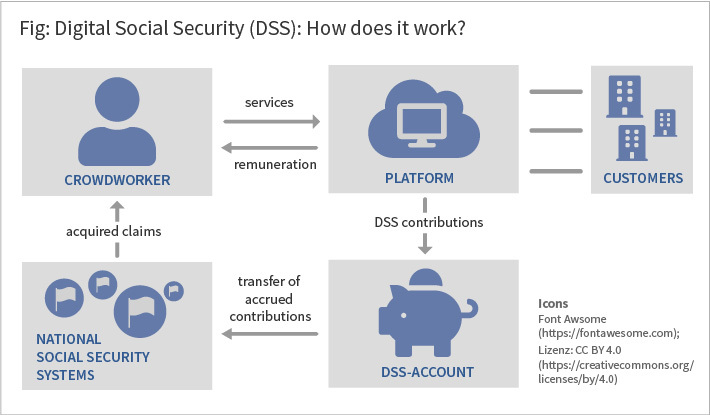 How does Digital Social Security adjust to different national systems? An international DSS would naturally not adhere to all single regulations of the different national systems, such as the concrete contribution rates. However, the proposal allows for high country-specific flexibility once the accrued DSS contributions cross the border into the national social security system. As one of the rules to solve the issues, one may proportionately scale the insurance claims to the ratio of contribution rates from the DSS and the national system. If – for example – the contribution rate in the DSS system is 20 percent below the contribution rate in the national system, the claims will also be 20 percent less. Furthermore, the distribution of the DSS contributions to different insurances/purposes would be country-specific, which should do justice to the strong differences between the national systems. For instance, one could first pay into those insurances that do not work according to the principle of equivalence (usually health), and distribute any remaining amounts to other insurances (such as pension) where claims could be scaled as described above. Thereby, regulations on minimum contributions could be followed, such as already present for social insurance for self-employed in several countries. Private insurances could be considered, if desired (e.g. in case no fully-fledged social security system is available). Any contributions that would not be mandatory according to national regulations could be paid out directly; besides overpaid contribution rates this may concern contributions beyond relevant assessment ceilings or contributions for earnings below certain limits, which are exempted from compulsory social insurance. Finally, right in the first instance country-specific adjustments of DSS contribution rates may be considered in order to replicate national conditions. On the downside, it may be undesired to distort competition (beyond the effect of the strongly different living costs) and one would still not mirror any regulations that make contribution rates person-specific. All that said, obvious difficulties arise in countries equipped with no social security system. Still, one may consider involving private insurances or similar local organisations then. Notwithstanding, in these cases more fundamental political steps would be of prime importance. For illustrating the functioning of DSS, the box describes three exemplary cases. As explained above, the concrete regulations remain flexible in that they are up to national political determination. Person A performs programming tasks on platforms in a developed economy, earning on average 6.000 euros a month. Her DSS contributions are shared among (1) the health insurance, (2) the pension fund and (3) the unemployment insurance. In (1), the payments exceed the minimum contribution and actually reach the relevant upper limit, such that A has full health insurance. Regarding (2), contributions are paid until the applicable assessment ceiling, so that substantial pension claims are generated. In (3), A gains claims for unemployment benefits (with the amount determined by her contribution level), since over, say, twelve months average contributions reached the relevant minimum amount. Since due to A’s high income DSS overpays social security contributions specified by the national regulations the amount not distributed in (1) to(3) is refunded. Person B receives social benefits and conducts microtasks on different platforms for an extra income of about 100 euros per month. B is covered by the health insurance provided by the state for welfare recipients. B’s DSS contributions are directed to the pension fund, where his claims from a former regular job are slightly increased. According to national regulations, due to the low earnings, B can also opt for a refund. However, in order to improve work incentives, the country currently considers lowering the burden of social security contributions not exclusively for very small jobs, but from a certain salary limit onwards. Person C lives in a developing country and tops up her income from a local job of 200 US dollars via platform work. While no fully-fledged social security system exists in C’s country, a basic health insurance is currently being created. C’s first income does not suffice to make the necessary payments. However, her DSS contributions can be directed to the health insurance and augmented by further own payments from the local job in order to reach sickness insurance coverage. Can social security be tackled without comprehensive regulation? Regarding platforms and platform work, there is need for broader political action beyond social security. Determining the legal status of platforms as well as clearly defining and distinguishing self-employment under the circumstances of diverse and flexible labour markets is key. Various issues such as working time, data protection, work safety, minimum wages or collective bargaining hinge on that, besides social security. It is likely that a non-negligible part of platform work should be classified as dependent employment. These jobs should be treated accordingly, which includes access to the full set of employees’ rights applying in the territory where the worker is based. In these cases DSS is still useful as an efficient tool to unbureaucratically organise social security in an amorphous labour market environment. Beyond, platform work will also involve many genuine freelancers and many more cases in the light grey area, where realistically a classification as dependent employment can be bypassed, given the international and flexible character of platform work, the potential for collusion between customers and workers and the limited range of formal national regulations facing a rapidly changing market. Here, DSS fills a real gap. In general, workers’ rights are meant to protect employees given their dependency on the relationship with the employer and the unequal bargaining positions. But social security arguably represents a crucial issue regardless of individuals being classified more as employees or as freelancers – or as something in between. Indeed, in several countries social security contributions concern also self-employed, either compulsory or on-demand. To conclude, DSS makes sense even facing ambiguities about the employment status of crowdworkers, which are not yet resolved and which might be treated differently over time. Do crowdworkers have the means to afford social security contributions? Platform workers often earn low wages, especially for simple tasks, which is to be seen against the backdrop of diminished transaction costs leading to strong international competition. For instance, in a forthcoming study, Uma Rani, Marianne Furrer and Christina Behrendt find average hourly wages of workers with 1 to2 years experience on microtask platforms of USD 4.92, or USD 3.76 including unpaid work (such as search and communication), with the distribution being left-skewed particularly in lower-income countries. Wages naturally depend on the type of work, e.g. regarding microtasks vs. more qualified jobs. It is well known that under these circumstances, a need for cash often dominates motives to provide for the risks of life. What should be the consequences? In many countries, the beginnings of today’s social security systems were organised in the late 19th and the first half of the 20th century. By that time, workers were arguably more in need for cash than today. Imagine reformers would have refrained from establishing compulsory social security based on this argument – societies would have lost a lot. Today, again, there is much to lose from political inactivity. Indeed, the medium-run goal of DSS is meant to be to initiate dynamics leading to better protection of platform workers and more sustainable wage developments. The income of workers must suffice both to make a living and to make provisions for old age, the case of sickness etc. But if this is not fulfilled, the absence of social security is surely no solution. Quite the contrary, poverty is most critical in times of hardship, where social security should step in. Otherwise, individuals might even further slip into poverty if e.g. time cannot be spent for education anymore or personal capital goods have to be sold. Even worse, the absence of social security can thwart any future investments for fear of calamities. In this sense, a high cash preference does even constitute a major justification for a compulsory social insurance. Beyond, adequate poverty reduction policies are called for, including to a certain extent reformation of platform work. Notwithstanding, in order to gain acceptance, the DSS project could start from low contribution rates – if only a few percent. And one may consider temporarily topping up private DSS contributions by public means, as far as compatible with the national social security framework. Would social security contributions be evaded? Obviously, compulsory financial contributions in informal worldwide employment relationships could be subject to substantial evasion effects. However, increased transparency on digital platforms can not only improve matching processes, but may also support the installation of a DSS system. Importantly, both the information on the contractor of a gig and the stated salary are digitally stored. Therefore, platforms could enforce adherence to the DSS rules, especially as the payments often have to be deposited in advance. Concretely, part of the deposit could be automatically retained and transferred to the DSS account, where, depending on the sharing rule, the required deposit would comprise a certain markup on the agreed salary. At least, platforms also enforce payment of their fees that are often higher than usual social security contributions. Then, it is up to political decisions within countries and a consensus among different countries to set such activity in motion. Realistically, this does not mean that fraud could be completely prevented, but the conditions to ensure compliance would be much better than for offline cash-based labour. Optionally, public institutions could also create own platforms that adhere to specific ethical and social standards and operate with reduced fees to leave room for DSS contributions. Special attention should be paid to the interaction of DSS and the official declaration of income. It stands to reason that black labour is quite prevalent in platform work. If the system allows tax and labour market authorities to learn of DSS money flows, as a side benefit, tax evasion and welfare fraud would be complicated. On the downside, this could reinforce incentives to switch to (potentially newly developing) unregulated platforms. In any case, to take full advantage of DSS, as a part of an established political consensus, authorities would have to enforce regulations and hinder illegal platform activities in their territory. In the light of these arguments, DSS appears as a promising option. Starting it as an experiment with low contribution rates would allow market participants and policy makers to gain experience with the new instrument. Once institutional structures have been established and further developed, the quantitative level could be raised. In the same context, further countries might be motived to join, in addition to those having made the first move. DSS represents a concrete step forward, being both feasible and socially beneficial. Naturally, there are some difficulties associated with the introduction – but it does provide a viable way to deal with growing risks of social problems that so far remain out of control. Berg, Janine (2016), Income security in the on-demand economy: findings and policy lessons from a survey of crowdworkers. Conditions of Work and Employment Series No. 74, Geneva, ILO. Harris, Seth; Krueger, Alan (2015): A Proposal for Modernizing Labor Laws for Twenty-First-Century Work: The “Independent Worker”. The Hamilton Project, Discussion Paper 2015-10. Hill, Steven (2015): New economy, new social contract: A plan for a safety net in a multiemployer world. New America Foundation, August. Huws, Ursula; Spencer, Neil; Syrdal Dag; Holts, Kaire (2017): Work in the European Gig Economy: Research Results from the UK, Sweden, Germany, Austria, The Netherlands, Switzerland and Italy. Foundation for European Progressive Studies. Rani, Uma; Furrer, Marianne; Behrendt, Christina (2018): Work and income security among crowd workers: A survey of micro task platforms. Journal of Economics and Statistics, forthcoming. Weber, Enzo (2017): Employment and the welfare state in the era of digitalisation. CESifo Forum, Vol. 18, No. 4, p. 22-27. I am grateful to Gesine Stephan, Ulrich Walwei, Kerstin Bruckmeier, Ekkehard Ernst, Hermann Gartner, Tobias Hellwagner, Thomas Kruppe, Michael Oberfichtner, Uma Rani Amara, Christina Schildmann as well as participants of the 2018 Policy Dialogue of the ILO Global Commission on the Future of Work, the 2018 LABOR.A, the 2018 Annual Conference of the Verein für Socialpolitik and the IAB-DiskAB 2018 for comments and support. Of course, all views and any errors are mine. 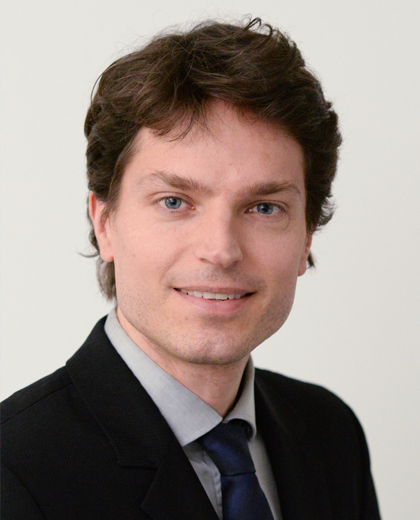 Prof. Dr. Enzo Weber is Head of Research Department "Forecasts and Structural Analyses" at the IAB. He also holds the Chair of Empirical Economics, in particular macroeconometrics and the labour market, at the University of Regensburg.